Horses need special care during winter months. Often, the combination of inclement weather and less daylight makes it hard to get things done around the barn. That’s why autumn is a great time to get a head start on preparing your property and horses for the cold months ahead. Here are a few ideas of what you can do now to ensure you and your horses enjoy a healthy and comfortable winter. Before the cold weather hits, check your barn to be sure it is properly equipped. In particular, test heaters that are used for warming water buckets and troughs. 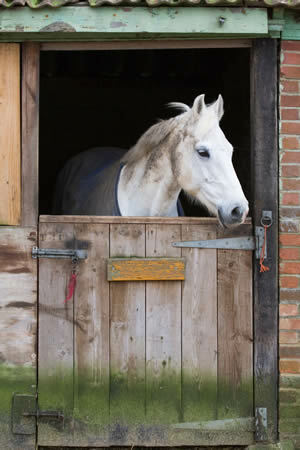 Experts also suggest checking ventilation inside the barn; to be sure your horses will get enough fresh air when they are stuck inside during bad weather. Take some time to walk your land. Start close to the barn and check lighting in key work areas. Replace bulbs or make repairs and make a list of types and sizes of bulbs to keep on hand. Next, walk your fence lines to check for damage. Shake poles to see if they are loose. Keep an eye out for dead trees or debris that could fall during a windstorm and make a plan for removal before bad weather hits. Fall is also a good time to start stockpiling snow supplies such as sand, salt or cat litter for traction. Stock up on winter-feed and medications as well. Start early to find a reliable supplier for winter-feed, so you don’t risk running out mid-year. Keep enough essential supplies on hand to last you through a long winter storm, when stores could be closed or inaccessible. Finally, inspect your blankets and tools. Check to be sure tools are adequate to last the season. Pull out all of your horse blankets and check them closely for mold other damage. Make sure they still fit comfortably on the horses they are meant for. Replace as need. With a little effort now, you can start the winter on the right foot (or hoof). The Country Stores carry a wide variety of horse care products, tools, fencing supplies and feed. We also offer classes on winter horse care. Stop by or visit our website to find out how we can help with your winter preparations.